UPDATE (21/01/15): Thank you to everybody who has contributed so far. We have had a great response, and reached our goal quicker than expected, which means we can now set our sights higher. Basically, more money means a bigger house with space for more students… and any money remaining from the cost of building will be used to furnish the house with beds, lockers, fans, and desks. 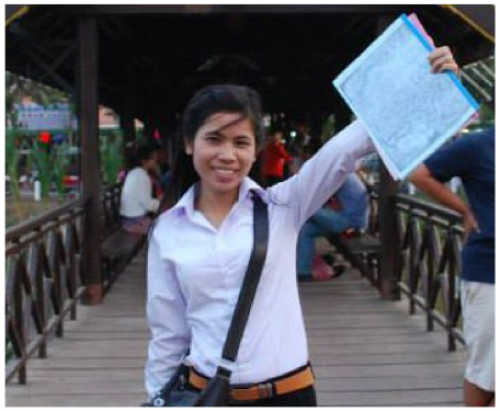 Every year the Human Capital Project (HCP) provides financing so that poor Cambodian students can go to university. However, that financing only covers the cost of tuition, and some rural students cannot afford accommodation in the city. While some male students are able to live at a Buddhist pagoda, that option is not available for the women. One of the HCP partner universities has agreed to make some of their land available to build a share house for poor female students to live for free, but they cannot afford to build the house themselves. The cost of building a basic brick share house is ~$4000 (AUD) so we have set that as the fundraising target. If we are able to raise more, then the extra money will go towards building a larger house to accommodate more students. Our goal is to begin construction within the next two months so that the share house will be available for the start of the next academic year (September). This project will change lives. Thanks to people like you, poor Cambodian women will have a safe and free place to live in the city while going to university, allowing them to follow their dreams. Please give what you can and share this project with your friends. For more information in this project, HCP, or other ways that you can help Cambodia, feel free to contact John Humphreys or Rachel Connor. Building a share house for poor Cambodian students in Kampong Cham. For people who contribute $100 or more, we would like to include your name on a "thank you" plaque attached to the share house. Please let us know if you do not want to be included or if you would like to donate in the name of somebody else. All donors are welcome to visit the university in Kampong Cham, and inspect the share house. Please contact HCP if you would like to arrange a guided tour.